When you have been injured in an accident, the attorney you select to represent you can have an effect on the ultimate outcome of the case. That is why it is so important to choose a lawyer and a law firm who will make your needs their top priority. At Hoggatt Law Office, P.C., we work hard every day to live up to the trust that clients in Brighton and throughout Northern Colorado place in us. We become personally invested in every case and client we take on because it is the right thing to do and because it works. By taking the time to get to know you on an individual level, we are better able to understand what drives you, what your values are, and how your injuries have affected your life. This information is often crucial in building a successful case for compensation. If you have suffered an injury at work or in a traffic accident, contact our office to learn how a small firm can make a big difference. Many other personal injury matters. We will conduct a full investigation into your accident and the circumstances that led to it so that we can identify who was responsible for the crash. Based on the results, we will begin building a case to get you the compensation you need to start putting your life back on track. Regardless of where you work, you are always at some risk for a workplace accident. Some occupations are more dangerous than others, but an employee who has been injured at work can usually collect benefits under the Colorado workers’ compensation system. Unfortunately, collecting the benefits you need is not always easy. We refuse to stand idly by and watch your employer and their insurance companies take advantage of you. Instead, we will continue to fight for you until you receive the benefits you need for medical expenses, lost wages, disability, job retraining, and other considerations allowed by law. If you would like to learn more about our firm and how we can help with your case, contact our office. 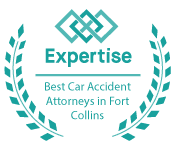 Call 970-225-2190 for a free consultation today. We serve injured victims and their families in Brighton, Adams County, Weld County, and the surrounding regions.